Travelling to the United States of America (USA) usually means an almost 24-hour flight including a stopover (of about 2-4 hours) at Hong Kong or Tokyo – by the time we reach the States for our holiday, we would have been super jet-lagged. Thus, I was glad to hear about United Airlines’ first ever nonstop flight service between Singapore and San Francisco that shortens the flight time significantly, saving four hours’ journey time each way between the two cities, as compared to other flights operating with connections. This flight also happens to be the only nonstop service to the United States from Singapore. With this flight, the flying time is now approximately 15 hours 30 minutes from Singapore to San Francisco and 16 hours 20 minutes from San Francisco to Singapore, and also importantly, with no stopovers! The Singapore to San Francisco eastbound UA2 flight departs Changi Airport at 8.45 am daily, arriving at San Francisco International Airport at 9.15am the same day (no – this is not a 30-minute long flight J ; San Francisco is 15 hours behind Singapore in time difference). The westbound San Francisco to Singapore UA1 flight departs San Francisco at 11.25pm, arriving at Singapore 6.45am two days later. United had also used the world’s most advanced passenger airplane, the Boeing 787-9 Dreamliner to operate this Singapore-San Francisco flight and this means improved lighting, bigger windows, lower cabin altitude and enhanced ventilation systems, making the flight a much more comfortable experience for passengers. I have an even better news for readers of PassportChop.com – I am partnering United to give away one return United Economy flight ticket to San Francisco to one lucky PassportChop.com reader. Read on for more details on how to participate in this giveaway, what you can expect on board this United flight and some tips to help make your flight with United a more enjoyable one. My experience with United got off to a great start even before I reach the airport. The United Airlines app (available on Google Play and Apple app store) is a very useful tool that allows you to manage all your flight matters e.g. selecting seats, online check-in, check standby/upgrade waiting list, on the go. I have never seen a more useful airline app than this United one. There is no need to check at the counter or call United about the wait list for upgrade or flight standbys – the wait list queue with passenger initials are indicated in the app itself. You can also check where the plane for your flight is coming from and whether the flight will depart on time. 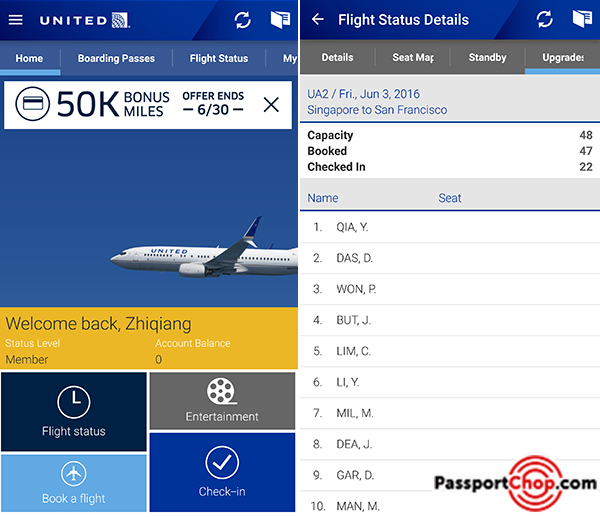 Checking in for your United flight is made so much easier using the United app – you no longer need to key in your passport details. 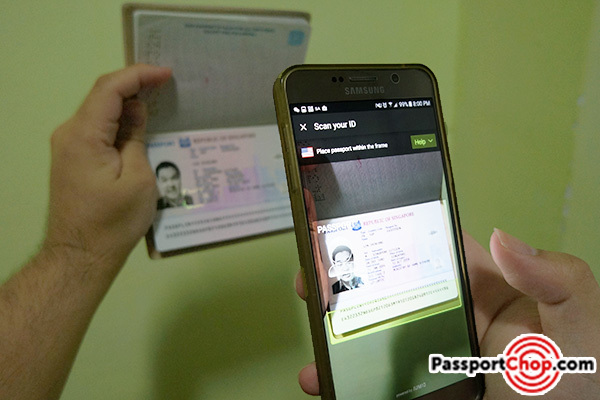 Using the app “Scan your ID” function, your information e.g. passport number, passport expiry, name are all automatically populated once your scan your passport! This works even for Singapore passport. The Singapore-San Francisco flight is operated with the new Boeing 787-9 Dreamliner aircraft, featuring a total of 252 seats – 48 in United BusinessFirst and 204 in United Economy, including 88 Economy Plus seats with added legroom and increased personal space. 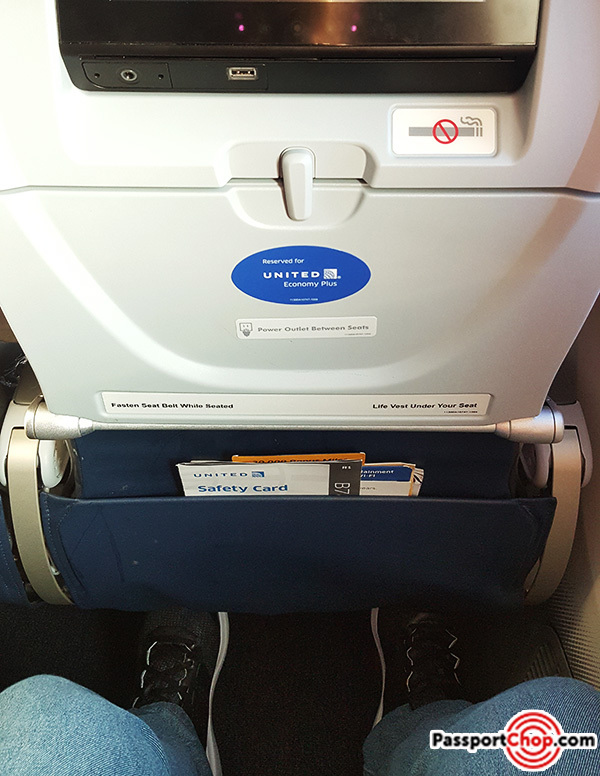 I recommend an upgrade to an United Economy Plus seat as you get more legroom (up to 7.6cm of extra legroom) – as you can see in the picture below, I am 1.75m tall and there is quite a lot of space for me at an Economy Plus seat. The fees for an upgrade to United Economy Plus vary based on the location of the seat e.g. an emergency exit seat and those at the bulkhead (Bassinet) area will cost the most. In general, you can expect to pay about 160 to 200+ USD one way for an upgrade to an Economy Plus seat for your Singapore-San Francisco flight. Do note that the United Economy Plus is not exactly the same as Premium Economy in other airlines. For example, your Economy Plus seat width is the same as that of an Economy seat and there are no special perks e.g. priority boarding, special Premium Economy menus, calf-rest and foot-rest. You just get more legroom, a seat that reclines a bit more than an Economy one and being at a cabin just behind United BusinessFirst, you also get to exit from the plane earlier than the Economy class passengers upon arrival. Each United Economy and Economy Plus seat is equipped with a 22.8-cm personal seat-back monitor delivering a multi-channel on-demand inflight entertainment system. There are lots of movies – both Hollywood blockbuster as well as international movies from around the world. You can also catch up on an entire season of TV shows e.g. Game of Thrones and Dexter. For an overview of the movies/TV shows you can catch during your flight, check out the movie/TV listings (in downloadable pdf files) at this United inflight entertainment page. They also did away with the annoying controller that was usually integrated in your armrest (the one which you can use to call for attendant help or switch on your reading light). You can control all that using the touch screen monitor in front of you. You can also your own more comfortable headphones to connect to the in-flight entertainment as they use the same headphone jack. The USB charging port is also right in front of you just below the monitor. Besides in-flight entertainment, there is another way to keep yourself occupied throughout the 15-16 hour flight – Wi-Fi internet! For 16.99 USD, you can get connected to the in-flight United Wi-Fi for the entire duration of your Singapore-San Francisco flight. This works out to just about 1 USD per hour of your flight which is great value for money. 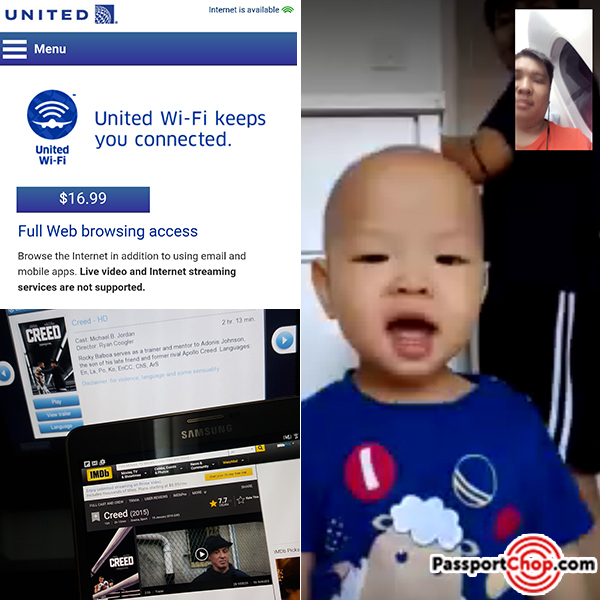 There are no data caps but it is explicitly stated that live video and internet streaming services are not supported – although I was able to use the United Wi-Fi to do a short WeChat video call with my son (the sound quality was not the best and laggy at times but not bad for an in-flight video call!). All you have to do to connect to the Internet is to first connect to the on-board United Wi-Fi – you will be directed to the United Wi-Fi page where you can pay with your credit card for internet access. Only one device can be connected to the internet you paid for. One thing I recommend you do before flying with United is to sign up for a United Airlines Mileage Plus membership. Remember the United app I mentioned above, you will require your Mileage Plus membership to manage all your flight matters too. With a Mileage Plus membership, you can use that as your login for United Wi-Fi and to switch the internet access to another device. The internet speed depends on the number of connections to United Wi-Fi and type of usage – if you are just checking Whatsapp, emails, the speed is ok but surfing the web like checking IMDB for your in-flight movie reviews might be a bit slower. What differentiates United Wi-Fi from other in-flight Wi-Fi services by other airlines is that it pulls data from satellites rather than from land-based towers so the data you get online is always real-time even when your flight is over the Pacific Ocean. One thing to note is that the United Wi-Fi service is available after the flight has taken off until just before landing – as a guide, when use of portable electronic devices e.g. laptop is permitted. United customers on this Singapore-San Francisco experience greater comfort with improved lighting, bigger windows, larger overhead bins, lower cabin altitude and enhanced ventilation systems. 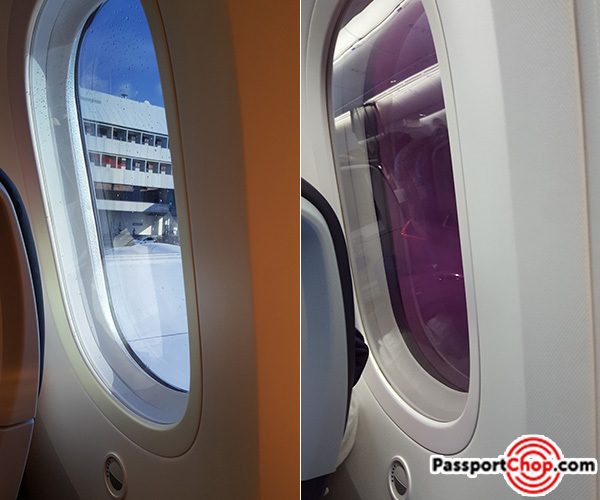 Just take a look at the picture below – the windows are huge and there is no window panes – you can control the opacity of the window from your seat but please note that there is a 1-2 second lag for the window to adjust to the opacity you choose – don’t keep pressing the button impatiently. 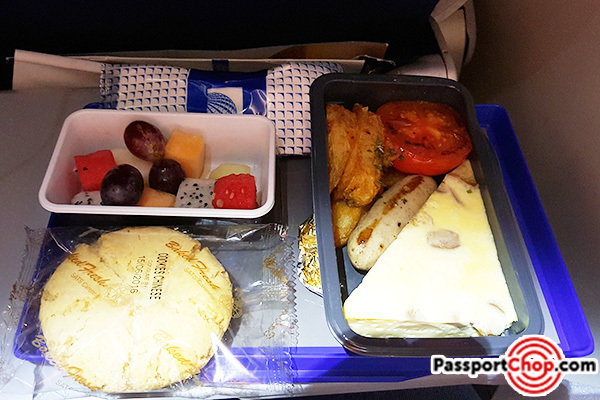 Just to provide you with an overview of what and when you can expect to eat during your flight (after all, there is nothing much you can do except eat, sleep and watch movies). 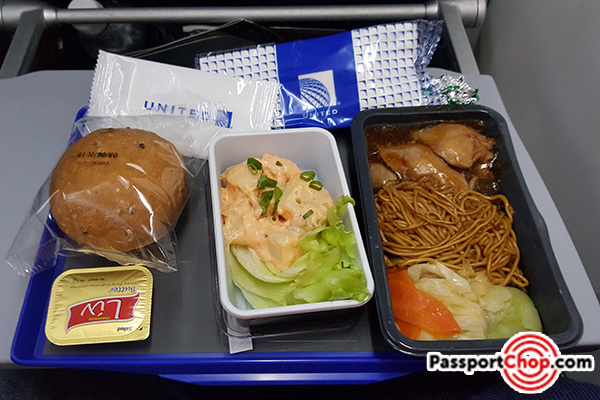 About 2 hours after take-off, we were served brunch – Chicken served with noodles and potato salad as an appetiser – not a surprise (the other option was a vegetarian pasta) since the Singapore flights feature additional amenities and services designed for Asian customers e.g. Chinese-language services for in-flight entertainment and Asian-style cuisine. 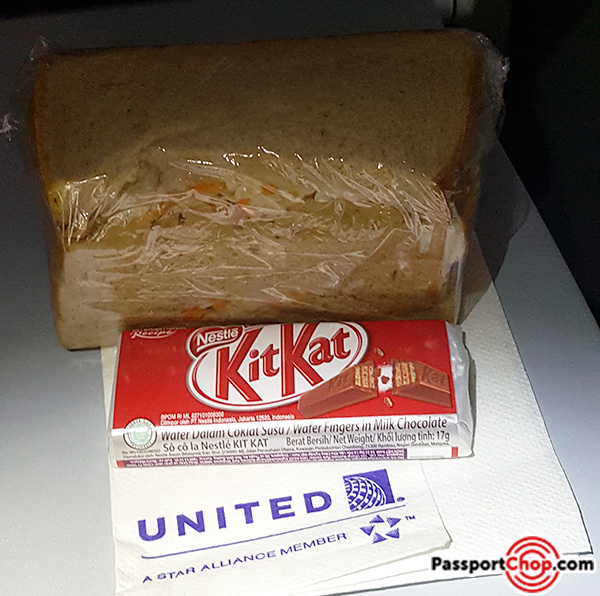 About 10 hours into the flight from Singapore to San Francisco, we were offered ham and cheese sandwiches with a kit-kat snack. About 2 hours before landing (at the 13th to 14th hour mark), we were served breakfast – omelette with sausage and potato wedges – an American breakfast to get ourselves started on an American journey at San Francisco! 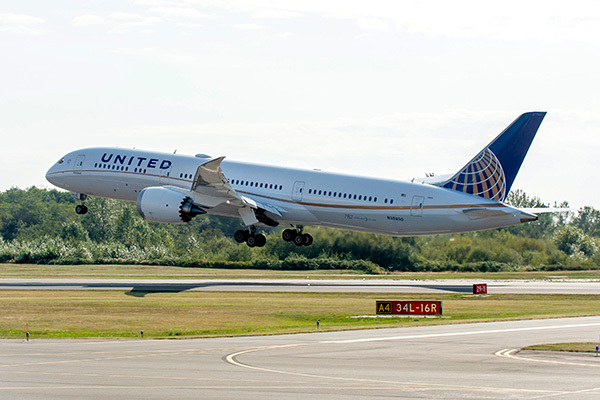 United has timed this Singapore-San Francisco flights to connect conveniently at San Francisco with an extensive network of service throughout the U.S., Canada and Latin America. United operates more than 250 daily flights from San Francisco to more than 90 destinations throughout North, Central and South America and the Caribbean. You will arrive at San Francisco at 9.15am – too early to check-in your hotel and you are feeling tired and in need of a shower after a 15.5- hour flight. Well, if you are United Global First or United BusinessFirst passenger, then you should check out the Arrivals Lounge in San Francisco, located in Terminal 3 on the baggage level. The Arrivals Lounge is a retreat where United Global First and United BusinessFirst customers arriving by noon on a same-day ticket may freshen up with a shower. 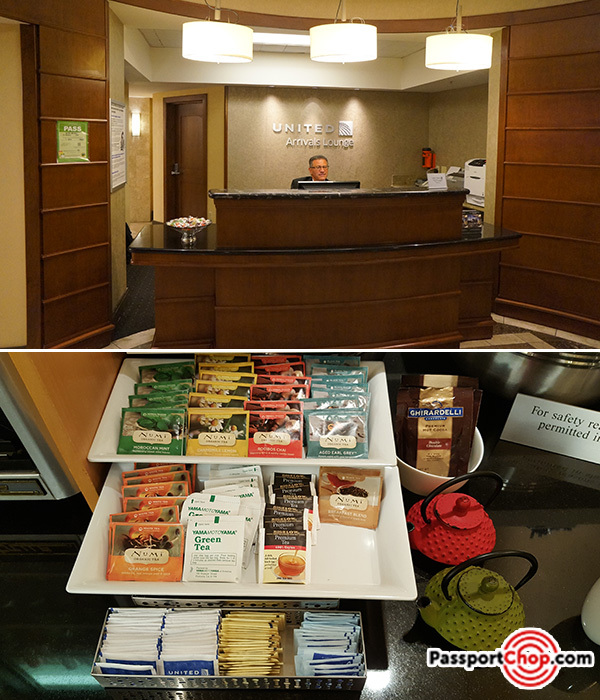 Guests can enjoy a breakfast and use complimentary Wi-Fi. Do note that United Global First and United BusinessFirst customers must ask a United representative at the airport to access the Arrivals Lounge. Access is subject to availability. Customers cannot bring guests into the Arrivals facilities. 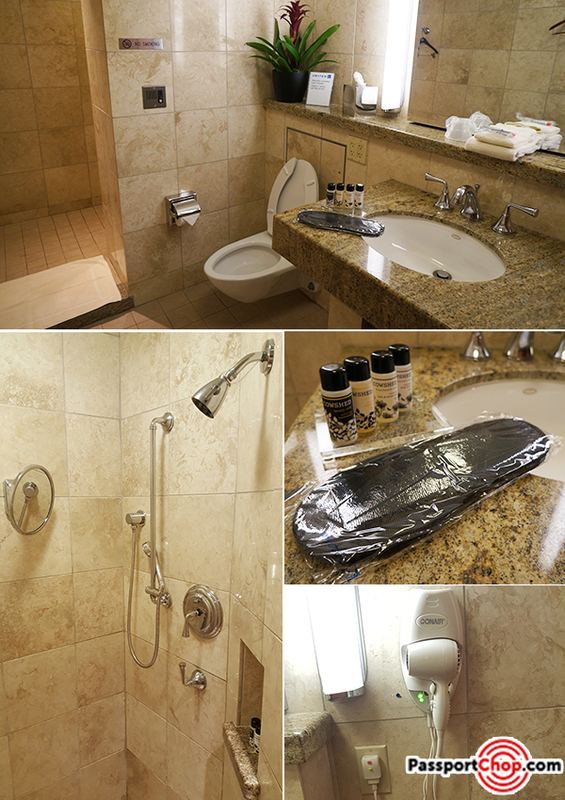 All the amenities you need e.g. shampoo, shower gel, hairdryer and dental amenity kits are available in the United Arrivals Lounge – you can also request for a bathroom slipper from the staff. If you have a shirt that needs pressing, they can also offer this complimentary service. The shower/toilet room is spacious – large enough to put your luggage to retrieve the clothes you need for your onward journey. Well, you have read a review of my awesome flight experience with United. Now it is your turn to experience this San Francisco-Singapore direct flight yourself. One lucky reader will win one return Economy air ticket (approximately S$1600 in value) on this United Airlines direct flight to San Francisco in our giveaway here. 2. Leave a comment below to tell us why you should win this return ticket to San Francisco and what will you do at San Francisco – the best comment wins (as decided by me). This giveaway ends 30 June 2016 11:59pm Singapore time and the lucky winner will be announced here at this blog post by 5 July 2016. Valid for round-trip transportation between the origin (Singapore only) and destination (San Francisco only). If issued for one-way travel, any unused portion will be forfeited. For inspirations on what to do and see in San Francisco, check out our next post on our 4 Day 3 Night shopping, eating and street art exploration itinerary in San Francisco. Winning the United Airlines airfare will enrich my travel experience a lot! I have never been to San Francisco so I will definitely check out your recommendations on what to do and see in San Francisco. Thank you for sharing this great deal – first ZUJI vouchers and now a return airfare to San Francisco – you can’t get more awesome than that. If I win, I will spend a few days in San Francisco savoring the Ghiradelli sundae ice cream and enjoying seafood at Fisherman’s Wharf before going to Las Vegas to try my luck at the casinos! I missed San Francisco so much since I was there 2 years ago – the “ding ding” of the cable car, the lazy sea lions chilling out by Pier 39. I will relive this experience again when I win this return airfare to San Francisco. Only 15.5 hours away to San Francisco – I can definitely do that. I get so tired flying to the States with the stopovers and long flight that i will lose one whole day to jet lag – so this United direct flight to San Francisco will help me to travel better in San Fran and experience more of the city. Thanks for this oppty! What – only Singapore residents eligible!? 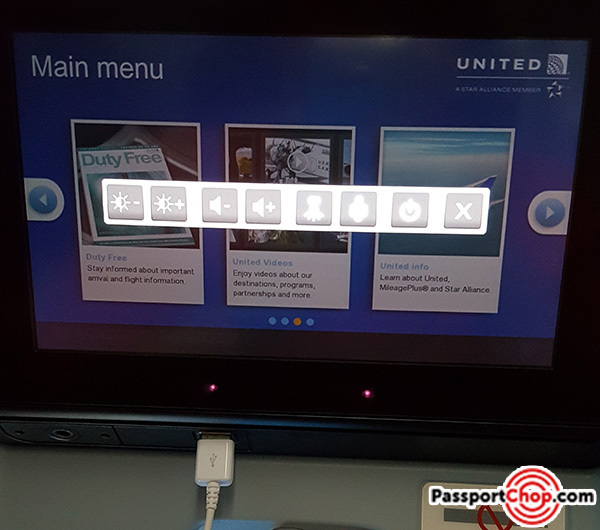 But it is ok – just commenting here to let you know that I appreciate your detailed review of the Singapore to San Francisco flight and it helps me overcome my fear of flying with United Airlines as I did not have a good experience with it previously. Awesome destination, high-tech aircraft and great service from an airline would be the best thing a traveller would ask for. It seems like you have had a wonderful trip. Congrats on being one of the firsts to experience a flight like this. The developements of long haul travel have been reflected well with this flight and for many who would not have a chance for this flight, this blogpost has opened up our views and allowed us to experience (through words and pictures) such an amazing flight. We thank you for this blogpost. I believe with such advancements, long haul travel would soon be more acceptable to everyone. The last time I was in San Francisco, I was 9 years old. I vividly remember bugging my parents to buy me a cookie while we were walking along Fisherman’s Wharf, and realizing it was the best cookie I had ever had in my life. Afterwards, we boarded the famous cable car for a ride. As 2 cable cars approaching from opposite directions passed, the passengers on each car waved and greeted each other. At 9, I was astounded by how friendly everyone was. I have such fond memories of San Francisco and hope to be selected so I can return and experience their warmth and friendliness again. Going on a grad trip – this San Francisco ticket will come in handy for sure! Winning this return trip to San Francisco would mean the absolute world to me. My boyfriend and I are currently in a long distance relationship (he’s in SF, I’m in SG) and we only get to see each other 3-4 times a year. As we didn’t get to celebrate his birthday together this year, I would love to surprise him during his birthday early next year by showing up at his doorstep with all his favourite goodies (particularly food!) from Singapore. San Francisco is an amazing place to be with the cycling across the Golden Gate Bridge to Sausalito, having delicious clam chowder at Fisherman Wharf, exploring the steep slopes with the cable car. Perfect for a vacation with loved ones. I have always wanted to go to the States for a holiday but the flying time and stopover timings are really scary for me. With this new United Airlines non-stop flight from Singapore, my fears are much more allayed – in just 15.5 hours, i will have reached San Francisco. I would love to visit the Golden Gate Bridge and take the cable cars to explore around the city. Finally shopping at Market Street for all the great bargains and deals in the states. My heart melts for it ’til the dusk of day. Fun, eat ’til day’s dawn. San Francisco is one of the best city because of it’s values. It has open-minded, individualistic people. Accepts everyone regardless or race, religion or sexuality. It has amazing weather throughout the year. I would love to visit San Francisco again not just for the Seafood nor the famous Golden Gate Bridge or the Alcatraz but also for the wonderful people and energy of SF! Besides the cityscape icons such as the gorgeous Golden Gate Bridge and the newly minted San Francisco Museum of of Modern Art, I would love to travel to San Francisco just to see how the land of liberty and freedom looks like, and observe the lifestyles of the locals there. After imbibing so much of American (pop) culture with its television programmes, books, movies and music, and learning about American history and politics, it’s time to see the real America with my own eyes! I want to cycle across the Golden Gate Bridge, have brunch at Mama’s, drive along the hilly Lombard Street, stuff my face with the freshest oysters at Fisherman’s Wharf, explore the former prison on Alcatraz Island, shop my hearts out at Union Square, view the pretty lights of the city on Twin Peaks, get arty-farty at the San Francisco Museum of Modern Art, picnic at Presidio Park with my favorite In-N-Out Burger, have a date night at Prospect and just being in San Francisco to soak in the sights and sounds. Can’t wait to fully experience what this amazing city has to offer! A non-stop flight to the USA is the biggest draw for me to visit the West. And it’s SFO which is rich in art & culture and not to mention the food. It will be great to visit this city and have a unique experience. I think this would make the perfect excuse for a solo trip to explore what the world has to offer. I’ve always wanted to venture solo to a far-flung destination but never really had the guts to make the plunge. (Bangkok doesn’t really count!) San Fran, with its host of brilliant things to do and friendly people, sounds like a great place for me to start creating some unforgettable travel experiences. My partner and i love to travel and with a no stopover from Singapore to San fran, means I can enjoy the good food beautiful city and the majestic golden bridge very soon! Looking at the review I cant wait to enjoy the comfort seat, enjoy the wifi, and looking forward to the destination! No stop flight to san Fran has definitely made travel easier. There’s no need to transit and spend several hours in the airport just to wait for the next connecting flight, now just 1 flight. United makes travel, Sure it does! S eriously, there is more than 1 reason why anyone should visit San Francisco with its friendly people and awesome cuisine. A mong the top of my list is the notorious Alcatraz Island which has fascinated me since I started watching the TV series (sadly though, season 2 did not return to screen). N ot to forget to visit one of the 3 great natural habours in the world, fisherman’s wharf, to satisfy the craving of chowder in me. C ruise down the Lombard Street with its 8 hairpin turn for a ride. I n my list will definitely be to take a picture with the iconic Golden Gate Bridge of total span of 9 thousand feet. S hort drive away will be the 10 acres of Golden Gate park for the athlete. C oming in next will be to have my postcard picture taken with the famous “Painted Ladies” of Alamo Square, one of the 11 historic sites. O h, and not to forget to visit Tom and Jerry Christmas tree which will be on display from the 12th of December with its big bright lights!